Autumn is well and truly on the way so I thought I'd round up my three of my fashion accessories which I know I'll be getting a lot of wear out of in the coming months and I've also popped a wish list up full of some more fashion accessories that I'm currently lusting over and that will be perfect for this Autumn. Fringed Boots: The 70's trend is continuing straight into Autumn and fringing is the ultimate nod to the trend. I'm so excited to pair these black fringed boots from Boohoo* with everything from jeans, skirts to dresses. I love that they come up a little higher on the leg too as they are completely different to any other boots that I own. Floppy Hat: If you've read my blog for a while then you'll know that I'm a die hard hat wearer, literally every outfit I will be wearing a hat with it. This rust floppy hat from M&S is the latest addition to my collection and I just love it. It's the perfect colour for Autumn as it's such a statement and I know it will see me right through the next couple of months. Skinny Scarf: Now this skinny scarf from Primark was never something I thought I would enjoy wearing but even over this past week I've worn it about 3/4 times. It really is so versatile and helps just make an outfit. I hardly wear any kind of pattern so this one is perfect for me but I also picked up a burgundy one too which I can't wait to wear. I've carried on with the fringing trend with this gorgeous suede fringing across the body bag from Accessorize, such a statement piece and perfect for you if you're not 100% into the 70's trend. Accessorize really do have some lovely pieces in at the moment (as always) and it's well worth taking a look at their handbag section if you're looking for a new handbag. Is it just me who always wants a different bag from Summer to Winter? Last year I loved my cape and am currently on the hunt for a new one, a different colour to create a different look and this one from ASOS is just beautiful, actually that whole outfit is lovely! Slouchy socks are an absolute essential for Autumn and my current favourites are these from Topshop and what is Autumn without a brand new hat, just look how cute this one is from River Island. What are your fashion accessories for Autumn? What do you think of my choices? 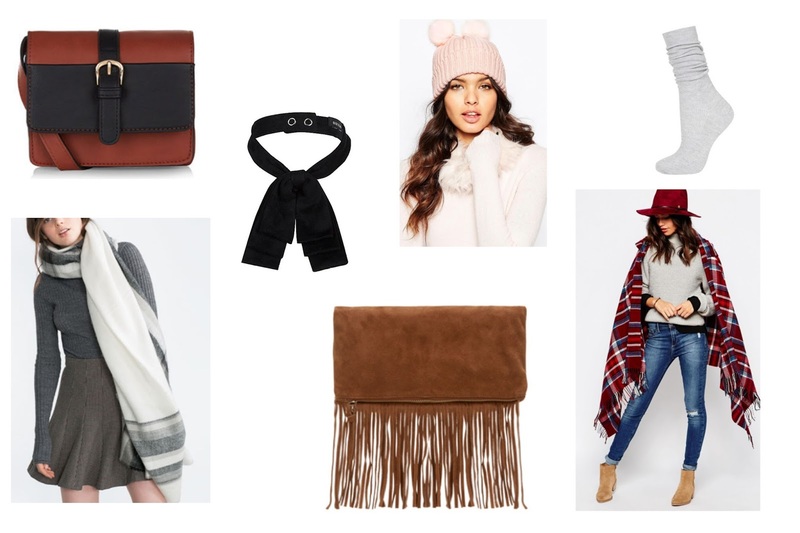 Post in collaboration with Accessorize but love of all things fringing and Autumnal by own.